Whew! We successfully survived the first phase of the Hwy 110 construction project. Over the weekend of August 5-6, MnDot opened up all of the east bound lanes! Yippee! But, they’ve now closed the west bound lanes. Sigh! You can go back to using Hwy 110 to get to us. Simply follow your normal route to the store and take Dodd Rd to Hwy 110. Getting home will be a bit more problematic. To go South or West, take Dodd Rd south to Hwy 494 W. To go North, take Dodd Rd north to the Marie Ave (the first stop sign; turn left and go to Victoria (the first stop sign); turn right and go to Hwy 13 (first stop sign); turn right and take go to Hwy 35E (less than 1/4 mile). Take Hwy 494 west to Dodd Rd, turn right and go 1.5 miles to the Village at Mendota Heights (take a right on the first street after Hwy 110 – Market St). You can return home the same way or use Hwy 110 east to connect to Hwy 52 or Hwy 494. It looks like we’ll have another 6+ weeks until this project is over. Thank you for your patience and support! After completing my 2nd swatch, blocking and hanging it for a while as suggested in the first blog post about our Aalto KAL, my gauge was still off by one stitch per inch – I have 21 sts and 27 rows per 4″ instead of the required 22 sts and 28 rows. So, am I going to make a new swatch on a smaller needle to try to squeeze in that additional st and row? No. Now, before you jump all over me for not getting gauge since that’s what we preach here all the time, I have my reasons. First, this is not a garment that needs to fit accurately (like a sweater or hat does). I did the calculations and realized that the difference in size is not going to make a big difference for me personally. I’m making the largest size, so I will be casting on 209 stitches. Almost 2″ difference. But, I’m tall and can handle that extra 2″ without any issue. I took a tape measure and held the end at the center back of my neck, down over the curve of my shoulder and along my arm. 20″ (half of the approx 40″ width of the front or back) hit me just above the elbow. I think that’s o.k. While I could simply measure each piece and hope for the best, the better way to make sure my front and back match in length is to count my rows. For 23″ at a gauge of 27 rows/4″, I should knit 155 rows (wow, that’s a lot of knitting!) before I start the shoulder shaping. What’s the best way to count my rows? I could use the old-fashioned method of hash-marks on a piece of paper. Or I could use the CountMeme App that I have on my phone. But, I’m worried that I will forget to “hash” or to press the button on CountMeme, so instead I am going to using locking stitch markers to mark off every 10 rows. For me, this will work the best. What technique will you use? 209 stitches to cast on is daunting – especially thinking that I would have to count those stitches multiple times in order to convince myself that I cast on the right amount. 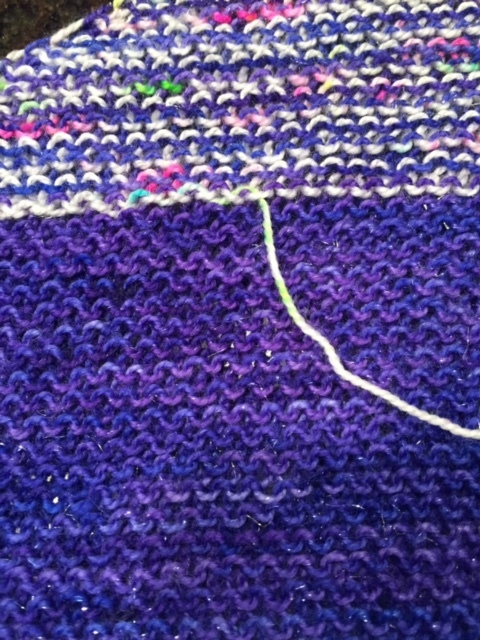 To make it more palatable, I put a st marker on my needle after every 10 stitches – as I was casting on. For 209 sts, I used 20 markers. I could have used regular stitch markers, but I used locking ones because they were handy. After I knit my first row, I will remove all except those marking the 50th, 100th, 150th, and 200th stitches. I’m leaving those in to help with counting later on. People always ask how to know how long of a tail to leave for long-tail cast ons such as the German Twisted Cast On called for in the Aalto pattern. There are many ways to accomplish this. Check out this Google search for some ideas. That’s it for now! Who’s started their project? 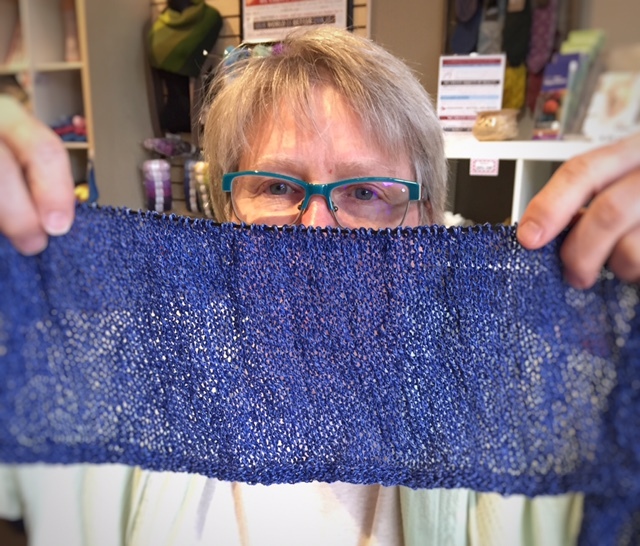 Aalto Knit-A-Long Starts June 1! We’re trying something a little new with our next Knit-A-Long (or “KAL” for short)! I fell in love with this pattern the moment I saw it. It’s perfect for every “body”! Cool and breezy for summer. Plus it’s an easy knit – two stockinette squares joined at the shoulder with a 3-needle bind off. Perfect summer knitting and summer wearing! We are offering Aalto Kits for this KAL. Each kit will include enough yarn to make Aalto in your chosen size, the printed pattern, and a little something fun for joining the KAL! The yarn is Shibui Twig, a 46% linen, 42% recycled silk and 12% wool blend that comes in luscious colors. Kits must be ordered by May 1st in order to start the KAL on June 1! In-Store – This is our traditional KAL format. Join me (Laura) for 4 sessions at the store from 2-4pm on the following Saturdays – June 1, 10, 17 and July 8. It’s just $15 to join the in-store KAL, but seats are limited to 10 participants. Sign up for the In-Store KAL here. Virtual – Since our space is limited for the In-Store KAL, I thought we would try a virtual way to join in the fun. We’ll have a dedicated thread on our Ravelry page to discuss our progress, post pictures, ask questions, etc. Plus, each week of the KAL, I will send out an email to all participants with a tip for completing your project – there may even be a video or two for special techniques that you might need. Virtual participation is free and is open to everyone (including our In-Store KAL participants). To sign up, just send me an email at laura@3kittensneedlearts.com. I’m really excited about this KAL. I wish we could start it today!